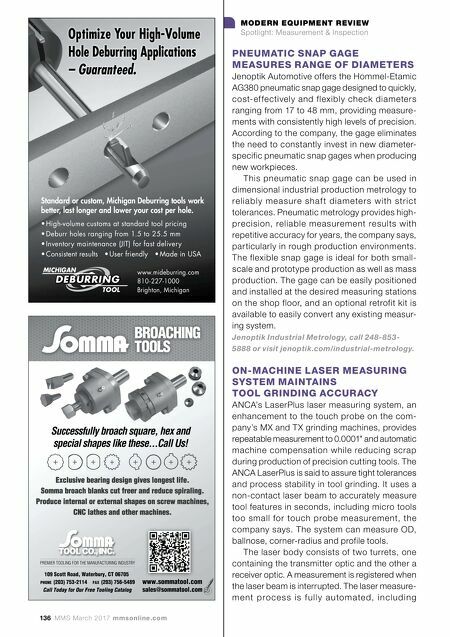 mmsonline.com March 2017 MMS 137 MODERN EQUIPMENT REVIEW Spotlight: Measurement & Inspection compensation for any out-of-tolerance conditions, thus supporting unmanned machine operation. 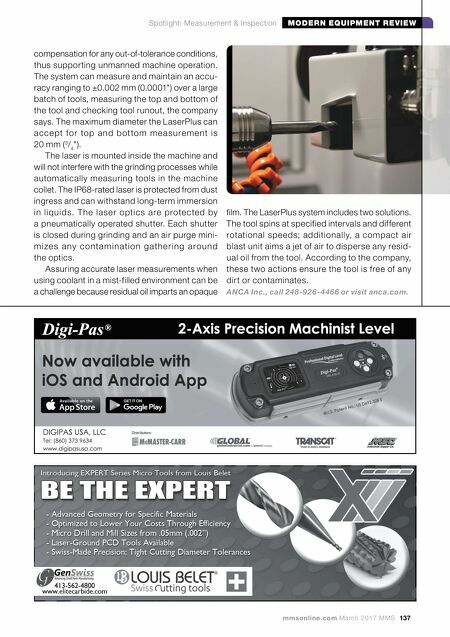 The system can measure and maintain an accu- racy ranging to ±0.002 mm (0.0001") over a large batch of tools, measuring the top and bottom of the tool and checking tool runout, the company says. The maximum diameter the LaserPlus can ac c e pt fo r to p a nd b ot to m m e a su re m e nt is 20 mm ( 3 / 4 "). The laser is mounted inside the machine and will not interfere with the grinding processes while automatically measuring tools in the machine collet. The IP68-rated laser is protected from dust ingress and can withstand long-term immersion in liquids. T he laser optics are protected by a pneumatically operated shutter. Each shutter is closed during grinding and an air purge mini- m i ze s a ny c o nt a m i n ati o n g ath e r i n g a ro u n d the optics. Assuring accurate laser measurements when using coolant in a mist-filled environment can be a challenge because residual oil imparts an opaque film. The LaserPlus system includes two solutions. The tool spins at specified intervals and different rotational speeds; additionally, a compact air blast unit aims a jet of air to disperse any resid- ual oil from the tool. According to the company, these two actions ensure the tool is free of any dirt or contaminates. ANCA Inc., call 248-926-4466 or visit anca.com.